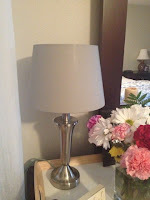 A few months ago, as part of my master bedroom makeover, I purchased two of these $10 gray Ikea lamp shades. They worked fine, but I kept looking at them thinking they just didn't pop - perhaps it's because the wall is also gray. 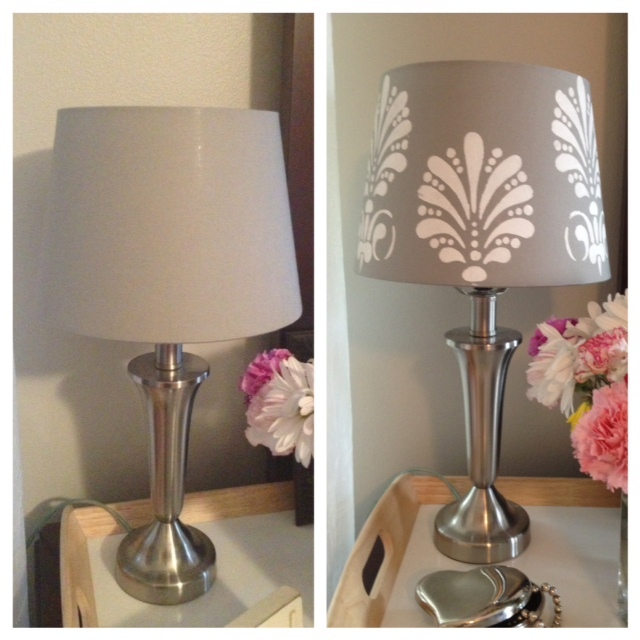 I decided they needed a little TLC and so I had at one of them with a stencil and some white paint. 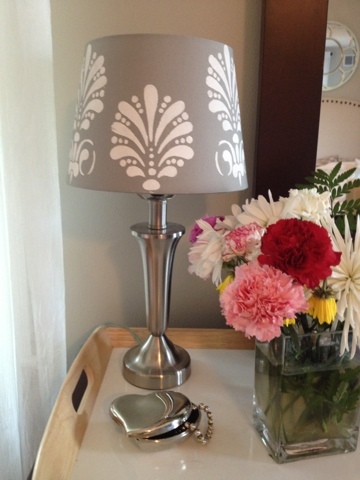 If you're looking for a fast way to spruce up a lamp shade - this is definitely it. It only took me all of about 15 minutes to do the whole thing. Here's what you'll need for this project...for easy planning I pulled all of the supplies into the Amazon slideshow below so you can just order all at once - or whatever you need - if you'd like. Here's how I painted the lamp shade. I taped the stencil onto the lamp shade and then used one of the smallest foam pouncers from the Martha Stewart set to apply white acrylic craft paint. 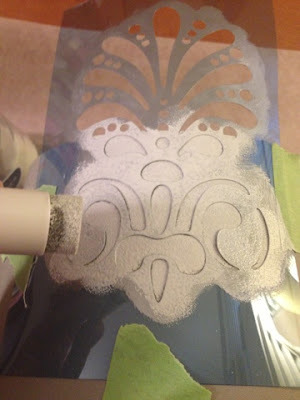 I blotted the paint on more than making strokes to prevent the paint from bleeding under the stencil. 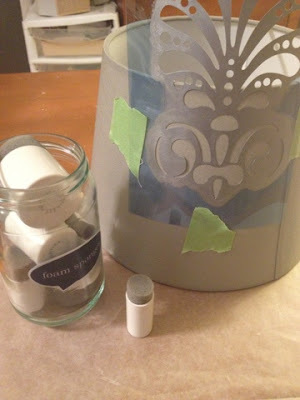 After I stenciled one section, I just moved the stencil around and painted another area. 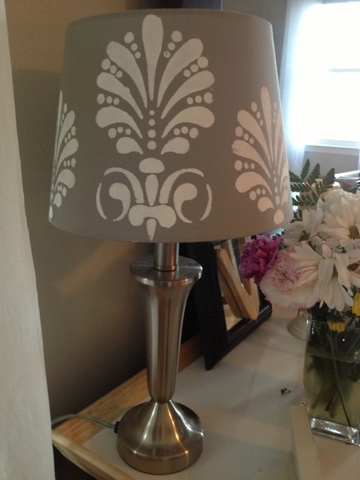 I found it easiest to hold the lamp shade in my hand while painting. This is one of those times you really wish you had a third hand....but if you can use your hand to apply pressure to the backside of the shade in the area you're painting it helps keep the stencil tight against the lamp shade. 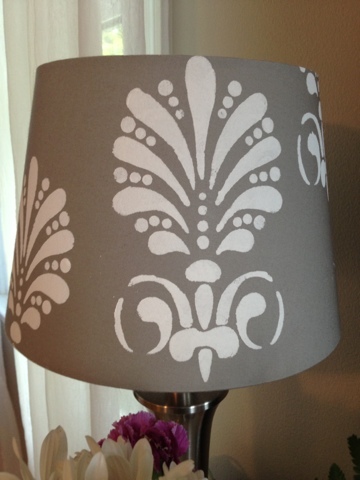 I'm thinking about taking my lamp shade makeover one step further and spray painting the base, but I haven't figured out exactly what color to do yet. What do you think?